For an old man like me, I can’t believe it’s almost end of the year, so this will be my greeting for end of the year and for a new year. A year went by so fast. I just finished my last seminar of this year in Vienna Austria where I had a wonderful time and received the same warm hospitality as I had every place I went this year for seminars. Can you believe that this year I went to Europe seven times? I spent more time than staying in NY. Every place I go in Europe, it seems to me that people are happy to spend time on the mat as much as I spend time on the mat with you. It makes me very happy and makes me to proud of myself to see a big improvement in your Aikido quality each time I see you. Another year is right around the corner and I’m looking forward to another meaningful year. I feel very honored when I receive invitations from many countries and I feel bad to say “No”, due to my tight schedule. I hope you understand. The seminar is March in Belgium and Barcelona and Germany in August are main events for many reasons, such as promotions. So please try your best to attend one of them. Have a merry X’mas and a happy new year. The year of 2014 is going to be a big and meaningful year for me. I will be the half-century anniversary of my time in the United States and of the NY Aikikai. I know that neither you or I want to miss such a great opportunity to have a big party and celebrate together. I had a few ideas to make this celebration an enjoyable one for everyone. One idea was to use summer camp for the time and location of the celebration, but unfortunately, that will not work out. It will be impossible to accommodate the many people who might come from all over the world. My second idea was to have a big seminar in New York City. It seemed like a good idea at the beginning, until we found out that there were no big spaces that could handle such a big crowd and provide us with the services we would need, like changing rooms and showers. There were also safety issues and regulations that both public and private places would impose on us and make the number of people who could participate very limited. I would not want to have many people shut out because of such restrictions. I’m very upset about these circumstances but we really have no choice. So here is my solution: In 2014, I will still conduct my yearly major seminars so I can see you all. Whenever and wherever you see me, just give me a big hug and warm words. Anyway, we will have a drinking party at the NY Aikikai sometime in June of 2014 and you will all be welcome to attend. I’ll let you know the exact date later in this year. Thank you for your understanding, your concern and your wish to help me celebrate. Year of 2012 is getting closer to its end. I hope all of you had a meaningful, enjoyable and positive year. Speaking for myself, it was once again a very busy year but I enjoyed any place I went for seminars. Thank you very much for taking care of an old man. Year of 2013 will be again a busy year for me and it is always nice to know that I am wanted by people. It gives me strong motivation and push me keep on going. I know that I still have to put more efforts to make Sansuikai a better organization for you. It will be my resolution of 2013. Wishing you to have a wonderful holiday season. Sensei’s seminars in Poland and in Lithuania have been postponed to May 2013. 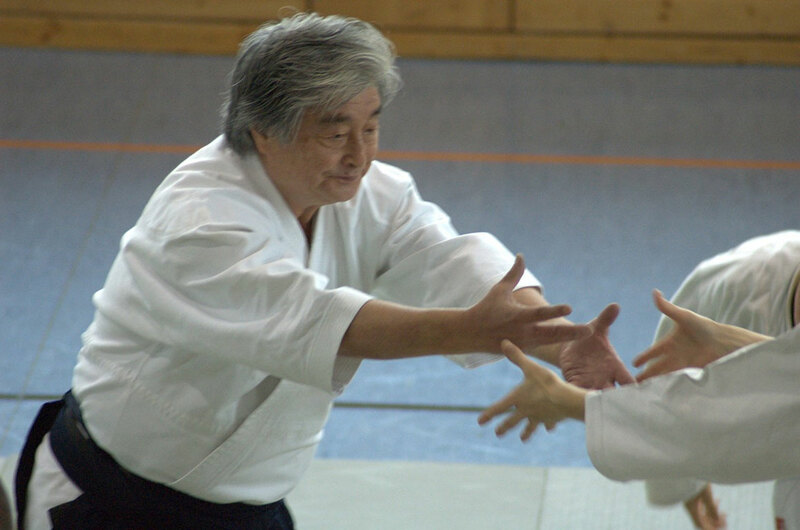 Sensei Yamada emphasized that only those dojos in which instructors are his direct students and regularly participate in his seminars (at least three times a year) can become members of the organisation. Participation in seminars and commitment to training are the main conditions set by Sensei for his students. During the meeting in Barcelona, Sensei awarded Fukushidoin (up to 3rd Dan) and Shidoin ( 4th Dan upwards) certificates to Sansuikai instructors. More information on the subject of Sansuikai International and the requirements which Sensei sets for his students can be found here. I’d like to take this opportunity to extend season’s greeting. At the same time, I’d like to thank you for your support and cooperation toward Sansuikai throughout the year. I’m looking forward to seeing you as many members as possible this year whenever, wherever I go for seminars. And when we meet, let’s greet each other with a big smile on the face. Smiling and laughing is the only human being among all animals can do. Greetings Sansuikai members in Europe. Hoping to meet all of you in Barcelona next March.